Discovering new food is one of the greatest joys of travelling. 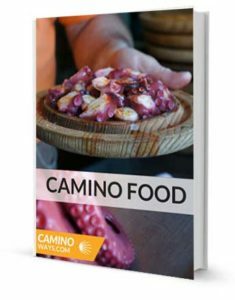 Download the Camino food ebook for some delicious inspiration before your journey. Along the Camino de Santiago you will be treated to a world of flavours and unique foodie traditions and etiquette. Our Camino Food ebook gives you a taste of the Camino, from 10 dishes every pilgrim should try to easy recipes and useful phrases you are likely to need along the way. With trails crossing the famous basque region of Northern Spain and the coastal Camino from Porto you will be spoiled for choice with wonderful Spanish tapas and delicious, fresh seafood. Whether you are about to embark on the Camino or have recently returned and are craving some of the Camino food gems, this ebook will give you food for thought. * By downloading your free Camino Food ebook you are agreeing to receive the CaminoWays.com newsletter. From Tarta de Santiago to tapas to fresh shellfish to chocolate covered churros, you will be spoiled for choice when you are eating in Northern Spain. There are certain regions that are packed full of vineyards and others covered in olive orchards. Fresh produce is everywhere and easily adapted in the menu of the restaurants along the Camino routes. For more information about the Camino Food you will taste along the way or to get details on any of the Camino tours please contact one of our Travel specialists.